Apple Pie Isn't Really "American"
“As American as apple pie” is a common phrase used to describe things that are undeniably American, like Uncle Sam, McDonald’s, and fireworks and barbecues for the 4th of July. But as popular as the tasty dessert might be in the land of the free, it isn’t actually American. First of all, apples themselves aren’t American. When colonists arrived in North America, they found only crab apple trees—and if you’ve ever tried to eat a crab apple, you probably know that they wouldn’t be very nice in pies. The most likely ancestor of apples as we know them today can still be found in Asia: the wild genus Malus sieversii. Alexander the Great is said to have discovered dwarfed apples in Kazakhstan and brought them back to Macedonia in 328 BC, but there is fossilized evidence of apples dating as far back as the Iron and Stone Ages in Switzerland and other parts of Europe. The Romans are thought to have introduced apples to England, and from there American colonists started spreading them throughout the New World. Apple seeds were spread along trade routes, but the early trees were unable to bear much fruit due to a lack of the European honey bee, Apis mellifera. This type of honey bee was shipped to the Americas in 1622. It was much more prolific than the native honey bee, the Apis mellipona, which produces less than one kilogram of honey each year (compared to the Apis mellifera’s 50 kilograms). As apple trees depend upon pollination to fruit, apple trees flourished after the introduction of the European bee. By the time apples arrived in the Americas, cooking with apples was nothing new. In fact, the first recorded recipe for apple pie was written in 1381 in England, and called for figs, raisins, pears, and saffron in addition to apples. Early apple pie recipes were a lot different from what we know today, as they rarely called for sugar, an expensive and hard-to-get item at the time. Originally, this apple pie was served in a pastry called a “coffin” which wasn’t normally meant for consumption and was only supposed to be a container for the filling. Similarly, Dutch apple pies—the type usually decorated with a lattice of pastry on top—have also been around for centuries. 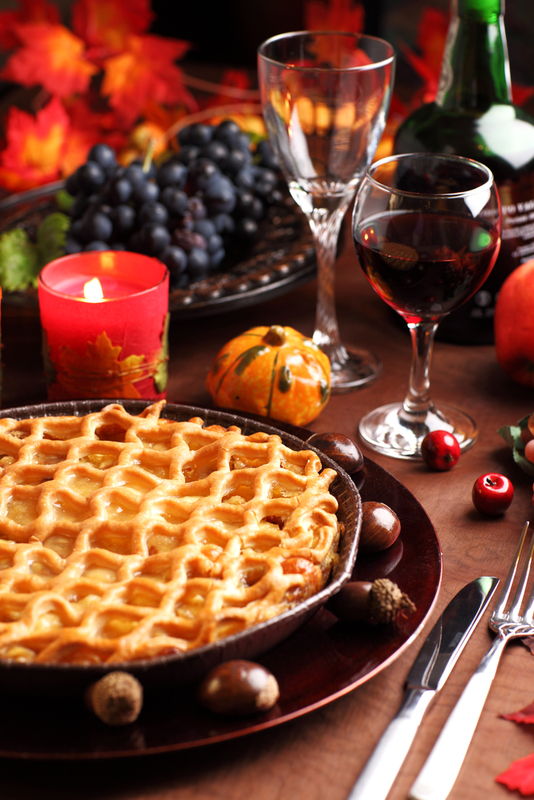 A recipe for apple pie very similar to today’s recipes appeared in a Dutch cookbook in 1514. A variety of other recipes appeared in French, Italian, and German recipe collections dating back to before the American colonies were settled. Even when the American colonists were finally able produce enough apples to cater to more widespread consumption, they were initially used to make hard cider rather than pie. Apple pies generally call for “cooking quality” apples—varieties that are crisp and acidic—and such apples hadn’t yet been developed in American orchards. Perhaps one of the contributors to making apple pies an “American” dessert is John Chapman, a Massachusetts man you probably know better as Johnny Appleseed. Born in Massachusetts in 1774, Chapman travelled through America’s frontier planting apple orchards largely in Pennsylvania and Ohio. Though he was considered a strange, eccentric person, Chapman did not plant apple trees at random; rather, he would plant his orchards and return years later to sell the land for a higher price. It’s estimated he walked around 10,000 miles before his death, and his way of life—usually walking around barefoot in the wilderness with just a knife for protection—earned him a spot as a tough but caring frontiersman and an American folk hero. Chapman’s beloved apples became “American” by association. Apple pie was further cemented in American history by a 1902 newspaper article that claimed “No pie-eating people can be permanently vanquished.” American soldiers during World War II also did their part to popularize the stereotype. When asked by journalists why they were going to war, a common slogan used as a response was, “For mom and apple pie” which later gave rise to “As American as motherhood and apple pie”. Because most Americans are suckers for patriotism, apple pie was quickly adopted as “the” American thing by the 1960s- “As American as apple pie”, dropping the more obviously not unique American thing of “motherhood”. An alternate theory sometimes put forth as to the origin of the expression is that it actually pre-dated the soldier’s usage and derivation of “For mom and apple pie”. In this theory, the expression was actually put forth as a part of a marketing campaign by apple growers, trying to get people to eat more apples. This was the origin of the expression, “An apple a day keeps the doctor away.” At the time that expression first popped up, a large percentage of apples in America were used to make hard cider, but with the women’s temperance movement and eventual Prohibition, apple growers started trying to promote the apple as more of a food item and the “apple a day” expression was one of the byproducts of that. It’s also very possible the above “No pie-eating people can be permanently vanquished” and similar such quotes were part of this push. However, despite my sincerest efforts, I was unable to find any first hand documented evidence to back up that latter theory for the exact expression “As American as apple pie”, nor instances of the exact expression pre-dating WWII. As there is first hand documented evidence to back up the “soldier” origin theory and the expression didn’t become prevalent until the 1950s and 1960s, long after the “hard cider” issue was a problem, I’m going with the soldier theory being the true origin, though it seems probable enough that marketers may have eventually had their hand in it and the theory is somewhat plausible with the push to get people to eat more apples in the early 20th century. When researching such things for a living, you quickly find that advertising campaigns are the root of an amazing amount of traditions, even things like the fact that today in the Western world it’s not common to have children fully potty trained until they’re 3-ish years old. This is around double what it was before the disposable diaper was invented and those companies making them heavily pushed that it was bad to potty train children sooner (even mentally traumatizing); and later that it wasn’t possible to train them earlier. For your reference, in Asia and Africa, 12-18 months is still the norm for fully potty training most children, particularly “day potty training”. In 1957 in the U.S., the average start time was 11 months, with a large percentage of children fully trained by 18 months, and 90% by 24 months. In Vietnam today, having babies mostly “day potty trained” by 9 months is the norm… Women shaving their armpits was also the result of another great somewhat recent marketing effort. It’s really astounding how much of what we think of as “the way things are supposed to be” or traditions originally came from some intentional marketing campaign or another. The apples sown by Johnny Appleseed were largely sour and inedible, and were usually used to make hard cider rather than be baked in pies or eaten raw. You’ll notice they left that information out of the children’s version of the Johnny Appleseed legend! While many European bees escaped their beekeepers and created wild colonies in the west long before settlers had the chance to explore the area, they were unable to cross the Rocky Mountains by themselves and had to be taken along when human settlers finally attempted to cross. More than half of the United States’ apples are grown in Washington, though New Zealand and other temperate apple growers are increasingly competing with the U.S. market. Interestingly, Australia has refused to import New Zealand apples since 1921 due to quarantine regulations for fire blight (a contagious disease affecting apples and pears). Apple seeds contain cyanide, making them toxic. While small amounts won’t kill you, there has been at least one recorded apple seed-related fatality due to the cyanide. “Apple pie isn’t really American”? Oh come on… next thing you’ll be telling us is that curries aren’t really English. Consider the apple itself, it originated in Asia. If brought to Europe by Rome then they passed through the Middle East. lol! All countries are.. don’t be a fool. Otherwise.. Why write this article? Well, what the British called apple “pie” was different from what ultimately became the American Apple Pie. American Apple Pie is as American as Apple Pie. This was very informative. I had to write a fun article as part of a Thanksgiving writing challenge this years. I had to write about something included apple pies. I was led to this site to get all the info I needed! Thanks for posting this. Dutch apple pie isn’t the type with lattice on top. It’s the type with brown sugar crumble. Dale Hash took the words right out of my keyboard. Lattice top is not Dutch. Fireworks are American? Hardly. China invented fireworks but Italy invented the aerial shell and also made fireworks colorful.